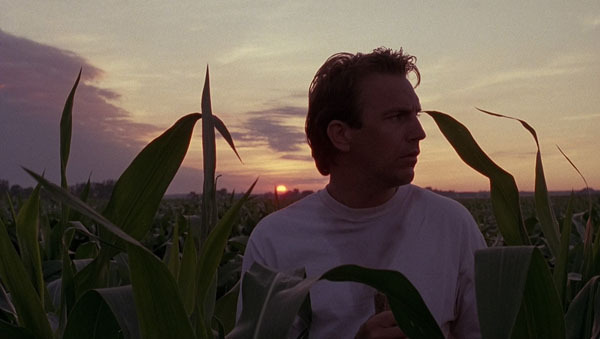 Over the past 30 years, Kevin Costner has appeared in a nearly 50 movies of extremely varied quality. In recent years, his reputation has dropped due to misfires (Dragonfly, The Guardian) and very conventional roles (Swing Vote, Rumor Has It). He also fell prey to his ego after Dances with Wolves’ success and delivered ambitious epics like Waterworld and The Postman. After discussing those two films this week, it’s time to recall some of his best work. To be clear, this top five is not looking at his best performances. Instead, I’m focusing on my favorite movies that featured Costner in a major role. The fact that these two impressive films are in my honorable mention reminds me that Costner has actually had a pretty strong career. Lawrence Kasdan’s revisionist western Silverado has great fun covering the familiar genre standards and adding a few twists. Costner is actually a supporting player behind Kevin Kline and Scott Glenn, but he exuberantly steals many scenes. This is a relaxing movie that rewards multiple viewings, largely due to the excellent cast. Bull Durham takes an enjoyable look at minor league baseball with Ron Shelton’s unique style. The dialogue is witty and crackles on the screen, especially between Costner and Susan Sarandon. I think it’s a bit overrated, but it still ranks among the top tier of baseball movies. This underrated Clint Eastwood film caught me by surprise because it actually puts the director’s minimalist style to good use. Costner gives one of his best performances as Robert “Butch” Haynes, an escaped convict who kidnaps a young boy (T.J. Lowther) as the Texas rangers pursue him. During this journey, their bond grows and we learn that Haynes might not be the terrible guy we expect. The script from John Lee Hancock (The Blind Side) gets under your skin and makes the climax surprisingly effective. I might even say that it "blind sides" us during the slow-moving story. Eastwood takes a rare supporting role, and the lesser screen time makes his character a lot more engaging. 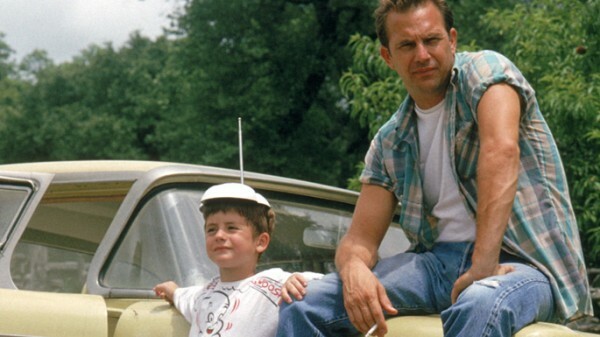 Costner’s legacy is tied most closely to his role in three baseball movies, especially this fairy tale. The story is definitely cornball, so it’s going to turn off some viewers. If you’re willing to take the ride, its magic still works. It’s a love letter to baseball prior to the destruction caused by the 1994 strike and the steroid scandals. Costner works best as the everyman who’s not trying to save the world. Instead, he just wants to play catch with his dad and save the family farm. It takes a pretty cynical person to not get behind that type of story. If only Brian De Palma could regularly channel the creative energy on display in this movie, he could have had a much different career. Costner’s straight-arrow Elliot Ness contrasts perfect with Sean Connery’s world-weary Jim Malone as they charge after Al Capone (Robert De Niro). Andy Garcia and Charles Martin Smith round out the lone group that is willing to take on the mob boss. Everyone’s working at the top of their game here, and De Palma crafts several memorable sequences. Yes, the train station sequence does copy from Eisenstein’s Battleship Potemkin, but it’s still a riveting sequence. Running a brisk two hours, this film doesn’t overstay its welcome and is a fun, tense-filled ride. I’m not much of a golfer, but I still find a lot to like in Shelton’s look at a worn-out golf pro Roy McAvoy taking a shot at greatness. Again, Costner’s everyman quality works here, especially as he hangs out with his small-town buddies at the driving range. Rene Russo (what happened to her?) is strong as the love interest, and Cheech Marin shines as McAvoy’s frustrated caddy. Don Johnson also plays the hotshot idiot role very well without overplaying his bad side. There are some flaws in this movie, but Shelton finds a way to nearly overcome them all. Another reason for this high ranking is the excruciating but perfect conclusion, which drags you along as McAvoy’s risky style may lead to an unkind end. I avoided this controversial Oliver Stone epic for many years because I expected an over-the-top, excessive mess from the hit-or-miss director. When I finally caught this film back in 2006 as part of a long marathon through Roger Ebert’s Great Movies book, I was stunned by its power. Stone held me spellbound for more than three hours, which isn’t an easy task in my hectic life. 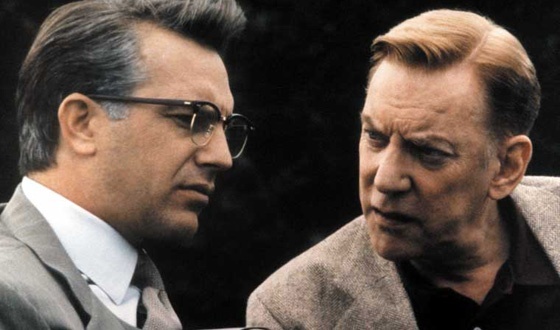 Costner makes Jim Garrison’s quest entirely believable as we follow him through the increasingly complex investigation. Regardless of the factual accuracy of this story, it delivers a stunning experience. I’d love to see your Top 5 choices in the comments section for this post. If you disagree, state your case and let me know why these picks don’t make sense. Next week, I’m closing out the We’re All Dead! Marathon by watching Gregory Peck and Ava Gardner cope with a nuclear apocalypse in On the Beach. I'm right with you on #1 - JFK for me as well. Very few films this length have kept me so interested throughout. #2 - Robin Hood Prince of Thieves - A perfect adventure film in my opinion. It's sometimes gritty and realistic, and other times a gay ol' swashbuckler. Costner is confident enough to make it all work. So many great scenes. Could rewatch endlessly (skipping the end credits each time). Damn you Bryan Adams! 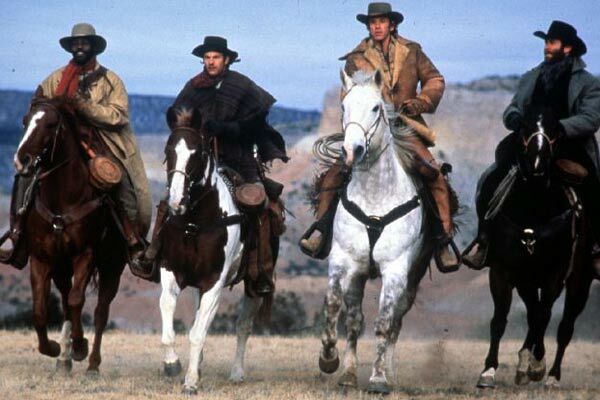 #3 Open Range - One of the finest westerns of this generation. Like 2010's True Grit there's a level of control and purpose to each scene that imo puts it on another level. There's no slack in the dialogue, no unnecessary scenes, no sour notes whatsoever. The craftsmanship is something to behold. Also endlessly rewatchable. 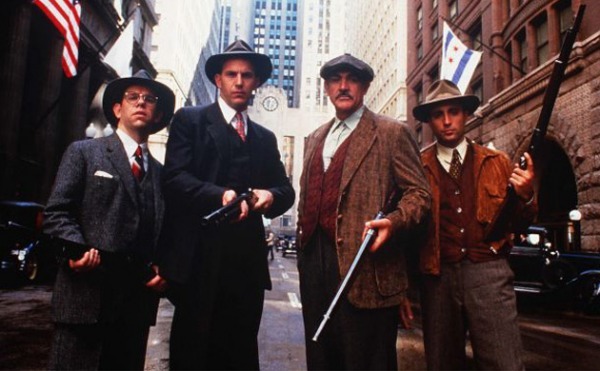 #4 - Untouchables - I enjoy the story. It's unique and the production quality is high. Memorable moments, great cast. #5 - Bull Durham - Good times. Costner is good but I think Saradon steals the show. It's been a long time since I've seen Robin Hood. I saw it in the theaters when I was 15 and then again a few years later, but it's been a long time. I probably need to visit it again, despite the Bryan Adams pain (ha!). I also haven't seen Open Range, though I've heard good things. It seems like we're on the same page with the others mostly (except Tin Cup). Thanks for the comment! Nice list Dan. I take it you aren't that big of a fan of Dance with Wolves? Definitely do see Open Range, it's a classic! Thanks Castor. There were a few movies that I enjoyed, but they fell just short of this list because of various reasons. Dances with Wolves fits in that category, along with Thirteen Days. Dances is a solid movie and has some great scenes, but I felt like certain moments were too heavy-handed and obvious. I pick Revenge as my all time Costner fave. It's too bad his star power has waned and he takes a lot of crap from people these days. I think he's a great actor and great director. For some strange reason....I even like The Postman....just a little. 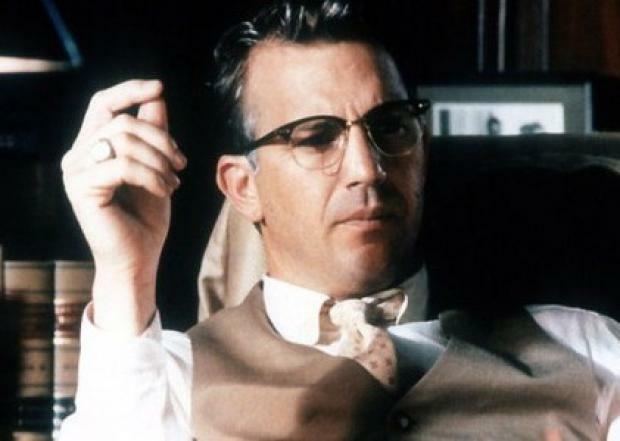 I haven't seen Revenge and agree that Costner gets a bad rap. It seems like he's still hurt by the reputation from Waterworld and The Postman. And I agree that while being a disaster, The Postman does have its certain charm. My number 1 is Open Range, everything that Smirnoff said about is true and can't be improved upon. #2 would have to be Field of Dreams. I was, at one time, the biggest baseball fan ever. #3 is Dances With Wolves, sure it's heavy handed at times and the scenes where Costner looks like he had his hair blow dried and coiffed drove me nuts. But it's still a great film. #4 is definitely Bull Durham, for the same reasons as Field of Dreams. And finally, #5 is a little seen film by most , called Fandango. It was made when Costner still was below the radar of superstar status and his performance is pretty good. Plus you get to look at Suzy Amis in her prime. Interesting. I haven't heard about Fandango, so I'll have to check into that one. It sounds like Open Range is definitely the real deal. Thanks! There's so much of his work that I haven't seen lately that I almost feel disqualified in answering. I will echo some love for Robin Hood...at first glance (and maybe even second and third), it appears a cheesefest, but smirnoff's description is right on. Bull Durham would be at or near the top of my list (I barely recall The Untouchables or JFK, and haven't seen Dances), but I love your placement of Tin Cup so highly. It's the one Costner (and Shelton) flick that's of high quality yet I feel is still underestimated or not taken seriously enough. Dylan, I really need to check out Robin Hood again. It's been a while. 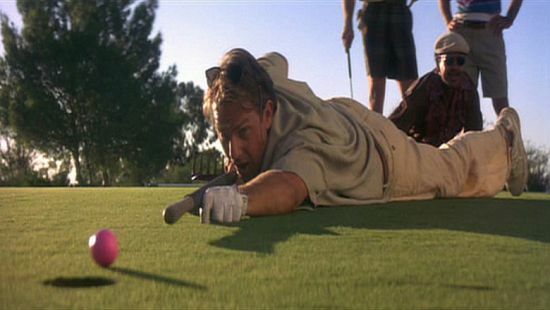 Tin Cup is one of those movies that's on TV a lot, and I never grow tired of seeing it. I definitely feel like it gets forgotten by a lot of people. I would have had Field of Dreams at the top. I've only ever met one person who hated this movie and she's also the only person I've ever met who hated The Princess Bride. Another comment that I should have responded to forever ago. How can someone hate the Princess Bride? I love Field of Dreams and think it might move up to #3 if I watched both of those again. Breaking the top two would be tough.